As a dog owner, it’s always fun to go out on a boat with your dog and have a great time out on the water. You can take your dog with you while fishing or just enjoying an hour or two sailing the waters. Sometimes your dog might want to go for a little swim. Besides, dogs love to be active and many of them enjoy heading out in the water. You probably have a life preserver of your own with you on your boat. However, as a dog owner, don’t you think your dog should have one too? Besides, not all dog breeds are capable of swimming well. It’s also important to ensure your dog is safe if your loved one has a desire to jump in the water and take a bit of a swim. 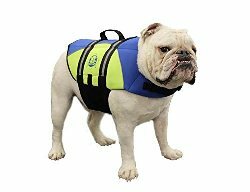 Fortunately, there are a number of canine life jackets and float coats that you can find for sale today. These include a great variety of models that are easy to put onto your dog and are very protective. Best of all, these can be found in a number of sizes for all kinds of dog breeds. They are made with plenty of sturdy materials that can add buoyancy. They also have a series of sensible straps that allow for a better fit. The outside physical bodies of these vests are also comfortable and will not cause your dog to feel irritated while wearing it. Proper drainage is also needed. That is, the jacket should allow water to move out without adding too much weight. This is needed to keep the dog from becoming overly dirty. It’s also to keep the dog from being tired. A good handle surface is also needed at the top. This can be used to attach a leash on the top but it might work best for when you need to guide the dog into and out of the water or at least keep your dog upright while in the water and add high visibility. 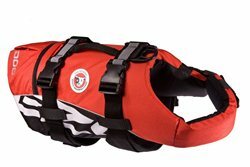 These particular dog life jackets are especially useful for all kinds of dogs looking to get outside and enjoy being with you in the water but safe and buoyant at all times. This first choice is made in a number of sizes and colors. 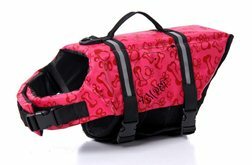 It uses neoprene straps to create a secure fit that goes over your dog’s body. It also has a grab handle that helps you to hold onto your dog as you ease the dog in and out of the water if necessary. The foam material is positioned carefully to keep the dog in a natural position while in the water. The trim can also reflect light well and can help you see your dog in any condition, thus giving you a more comfortable look at your dog in any condition you see fit. The Ripstop jacket from Outward Hound features two grab handles and a series of side release buckles that are easy to adjust. It offers enough support for your dog regardless of its size. Speaking of which, this comes in five sizes. 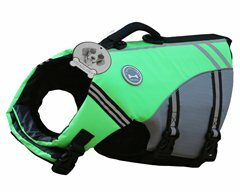 The front foam float support will keep your dog’s head above water. It secures well at the front while being connected with a strong adjustable handle. A mesh belly band is also included. This allows the jacket to drain out well so water won’t be stuck all around. There’s even a leash attachment at the top part of the jacket. You can order this option from Vivaglory in a few sizes and in one of six bright colors. Each of these is made with a fully reflective body while the inner parts feature mesh materials that are easy to wear. 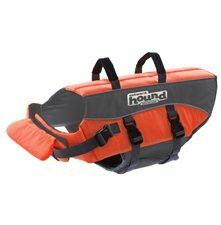 This offers more floatation materials and has a sport-style design that does not hinder your dog’s natural movements. A center weighted grab handle is also included to help you carry your dog around in the event your dog falls over or there is some kind of emergency. Another choice that can be found in six sizes, this uses a series of nylon straps that are easy to adjust. The reflective strips are especially made to make it easier for you to see your dog in any place. The setup works with a comfortable design that is adjustable and offers a neck cuff to keep the jacket in its place. This offers a better design that is not too hard for the dog to wear. The mesh underbelly also offers a good fit on your dog’s body. It especially does well for draining out water. This prevents exhausting from developing, what with the jacket not carrying far too much weight. This last option to look at is a jacket that features a bright color and is available in four sizes. It uses two separate layers of foam floatation materials. This allows for plenty of protection. 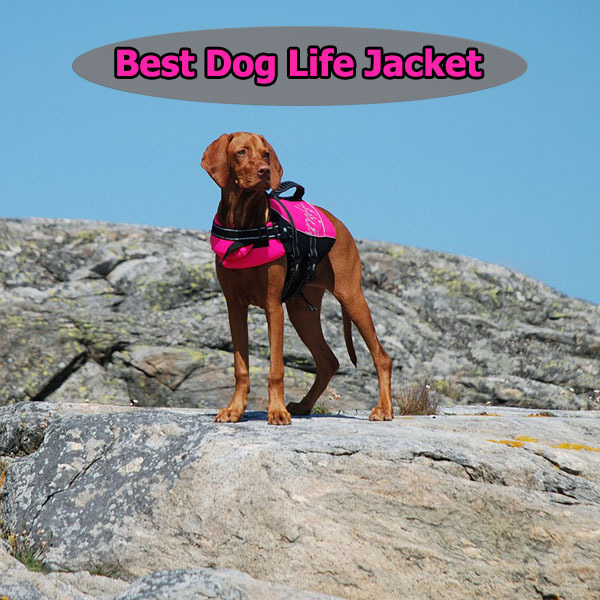 The floatation features also keep your dog upright as they are evenly arranged around the entire body of the jacket. The buckles on the sides are quick-release models. These offer a good fit and can be quickly adjusted. These are especially organized to where your dog will not be able to easily trigger the release functions on those buckles. This is all paired with a reflective detailing feature to ensure that your dog will keep in the vest without slipping out or being harmed. You must look well when getting a great dog life jacket ready. Make sure you look properly at what’s around so you will have something that will keep your dog protected without any risky problems. After all, your dog deserves to be out there on the water with you.